Earthy line display stand is great for necklaces, chains, gemstone necklaces will catch customers attention: 10"H x 6"W x 4.5"D. Color: textured linen in burlap finish. Earthy line display stand is great for necklaces, chains, gemstone necklaces will catch customers attention: 11"H x 7.5"W x 5"D. Color: textured linen in burlap finish. Combination display is great for necklaces, set of earrings, and ring. 9"H x 4"W x 3"D. Color: textured linen in burlap finish. Laying down elongated shape gives a different angle for displaying necklaces. 3.5"H x 6"W x 8"D. Color: textured linen in burlap finish. Medium size display is great for necklaces. 7.5"H x 5"W x 4"D. Color: textured linen in burlap finish. Earthy line display stand is great for necklaces, chains, gemstone necklaces will catch customers attention: 15"H x 8"W x 5"D. Color: textured linen in burlap finish. Necklace, chain display stand will catch customers attention: 14"H x 8"W. Color: textured linen in burlap finish. Heart-shaped display easel is great for necklaces, chains, chains with pendants. 8 5/8"H x 7"W. Color: textured linen in burlap finish. Necklace, chain display stand will catch customers attention: 14"H x 8"W. Sold in sets of 2 pcs. Color: textured linen in burlap finish. Heart-shaped display easel is great for necklaces, chains, chains with pendants. 8 5/8"H x 7"W. Sold in sets of 2 pcs. Color: textured linen in burlap finish. Necklace, chain display stand will catch customers attention: 12.5"H x 8"W. Color: textured linen in burlap finish. Necklace, chain display stand will catch customers attention: 8.5"H x 4"W. Color: textured linen in burlap finish. Elongated shape gives a different angle for displaying necklaces. 8"H x 7"W x 6.5"L. Color: textured linen in burlap finish. 12-ring display holder: 2.5"H x 3"D x 8"L. Color: textured linen in burlap finish. Earring display stand holds up to 2 pairs: 2-1/4"H x 4'long x 1.5"D. Color: textured linen in burlap finish. Earring display stand holds 1 pair: 3"H x 2.5"W x 1.5"D. Color: textured linen. Earrings display stand is great for all styles of earrings: 4"H. Color: textured linen. Earrings display stand is great for all styles of earrings: 6"H. Color: textured linen. Earrings display stand is great for all styles of earrings: 4"H. Color: light linen canvas. Earrings display stand is great for all styles of earrings: 6"H. Color: light linen canvas. Earrings display stand is great for all styles of earrings: 4"H. Color: textured linen in burlap finish. Earrings display stand is great for all styles of earrings: 5"H. Color: textured linen in burlap finish. 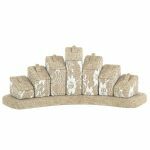 5-ring slot display holder: 1"H x 1-3/4"D x 8"W. Color: textured linen in burlap finish. 5-ring display holder: 2"H x 2"D x 8"L. Color: textured linen in burlap finish. Set of 7 ring display columns with elegant curved base: 11"long. Color: textured linen in burlap finish with white print. Earthy line display stand is great for necklaces, watches, chains, bracelets, scarves. 18"H x 14"W. Color: textured linen in burlap finish. Earthy feel & look display stand is great for watches, bracelets. 5"H x 7.5"W. Color: light linen canvas. Jewelry display ramp is great for a single bracelet. 8"L x 1.5"W x 2"H. Color: textured linen in burlap finish. Earthy line display stand is great for necklaces, watches, chains, bracelets. 12"H x 12"W. Color: textured linen in burlap finish. Earthy feel & look display stand is great for watches, chains, bracelets. 7"H x 12"W. Color: textured linen in burlap finish. Earthy line display stand is great for necklaces, watches, chains, bracelets. 10"H x 9"W. Color: textured linen in burlap finish. Earthy line display stand is great for necklaces, chains, gemstone necklaces will catch customers attention: 3.5"H x 3"W x 4"D. Color: textured linen in burlap finish. Earthy line display stand is great for necklaces, chains, gemstone necklaces will catch customers attention: 4-7/8"H x 7"W x 8.5"D. Color: textured linen in burlap finish. 1-ring display holder: 2"W x 2"D x 1-1/4"H. Color: textured linen in burlap finish. Jewelry display bar is great for watches, chains, bracelets. 8 1/4"L x 5"W x 2 1/2"H. Color: textured linen in burlap finish. Jewelry display stand is great for watches, bracelets. 12"H x 12"W. Color: textured linen in burlap finish. Jewelry display stand is great for watches, bracelets. 13"H x 12"W. Color: textured linen in burlap finish. Jewelry display bar is great for watches, chains, bracelets. 5"L x 5"W x 2 1/2"H. Color: textured linen in burlap finish. Earthy feel & look display stand is great for watches, bracelets. 5"H x 7.5"W. Color: textured linen in burlap finish. Combination display is great for necklaces, set of earrings, and ring. 8"H x 6.5"W x 5.5"D. Color: textured linen in burlap finish. Jewelry display set includes 9 pcs. Dimension: 13"dia x 14.5"H. Color: burlap.